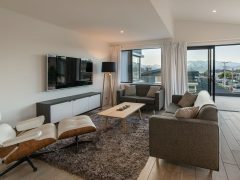 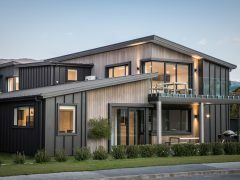 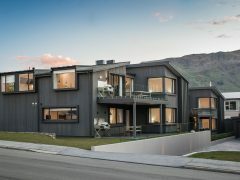 Situated close to Wanaka’s CBD, these five-bedroom visitor accommodation townhouses enjoy impressive panoramic views Lake Wanaka. 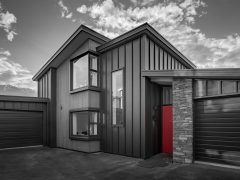 The townhouses have been designed to maximise site density within the confines of the zoning provisions for the site. 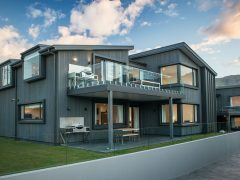 As a compliant activity no resource consent was required which helped fast track the project to construction. 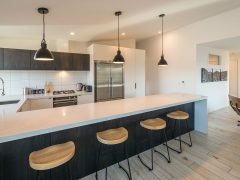 Each townhouse is dual key and can be rented as separate 2-bedroom and 3-bedroom apartments or rented in its entirety as a 5 bedroom family holiday home. 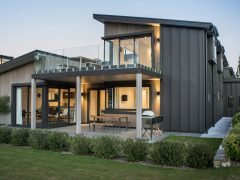 Externally clad in dark stained cedar metal and stone, the clean geometries of the elevations reflect the clients desire for low maintenance materials appropriate to the harsh extremes of the Central Otago climate. 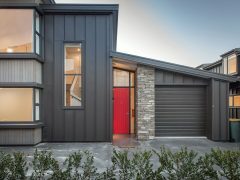 Internally the material palette is simple and refined; floors are oak, walls are generally white with cedar and steel features.